Discover Your Menopause Type redefined menopause as a natural transition in which every woman is different. This book revealed that the “one-size-fits-all” approach that has been used by both mainstream and holistic practitioners was ineffective in guiding women through this natural transition. Discover Your Menopause Type is the authoritative guide on menopause type® identification and management. Based on widespread clinical experience, extensive review of lab tests and exhaustive review of scientific literature, this book presents clear and practical information on identifying and treating the unique menopause type® of each woman. Dr. Joseph J Collins, RN, ND has worked in both private and group practice before becoming an educational and clinical consultant for laboratory assessment of hormones. He continues to maintain a limited private practice. Dr. Collins currently serves as a consultant and lecturer to physicians, pharmacists, and consumer health groups. He is widely regarded as a leader phytotherapeutic management of hormone health, as well as advanced assessment of endocrine function. Even though every woman is different, traditionally every woman has received one type of menopause therapy--a "one-size-fits-all” hormone solution. This is the first book to offer women an individualized treatment for the specific symptoms of menopause. In Discover Your Menopause Type, Dr. Collins has identified 12 distinct menopause types® and developed a treatment for each. With this unique book, Dr. Collins shows women how to determine their own menopause type and then prescribes a nutritional, herbal, and if needed, a hormonal treatment program to manage the symptoms for each type. 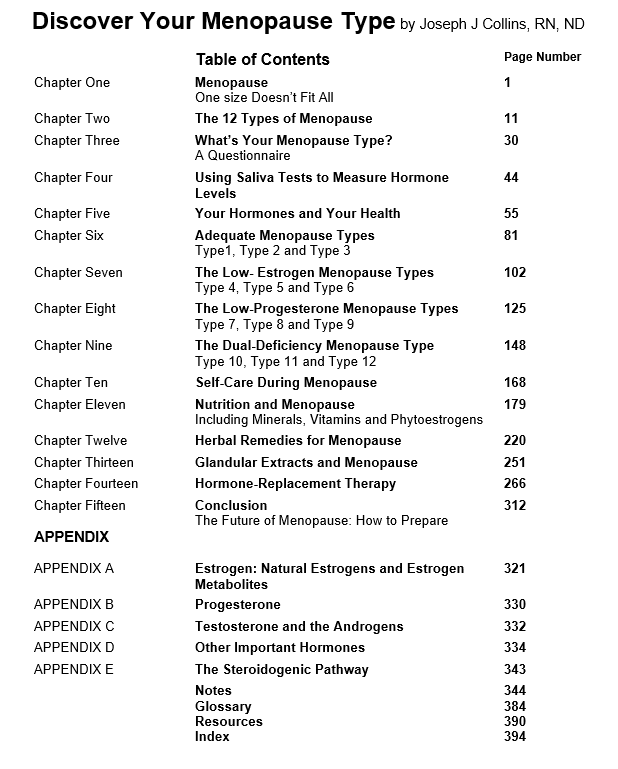 He also provides women with a complete description of hormones and their effects on the body, a questionnaire for the reader to determine her menopause type, advice on how to properly interpret laboratory hormone tests, and suggestions for choosing a "hormone-educated" healthcare professional. 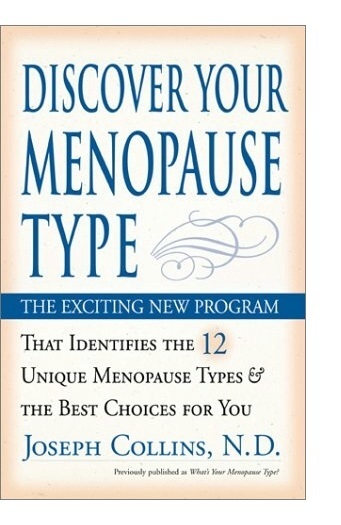 Order the book, Kindle Edition: Discover Your Menopause Type, by Dr Joseph J Collins. Copyright © 1999 - 2018 Your Hormones, Inc. All rights Reserved. and are not intended to diagnose, treat, cure, or prevent disease. The content is the opinion of the authors and does not represent the opinion of any party. See Terms of Service and California Proposition 65.